This report was produced for the Police Foundation by the Institute of Criminal Policy Research, King’s College London. 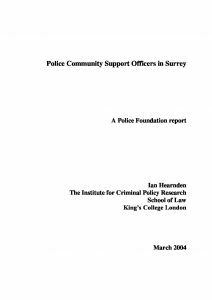 It presents an evaluation of Surrey Police’s first intake of Police Community Support Officers (PCSOs). The report offers a series of recommendations based on the implications of the findings at that time, including possible directions in which the PCSO role could be developed.